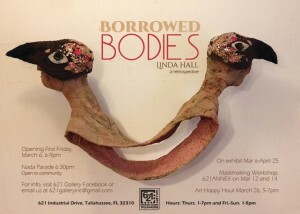 Borrowed Bodies: A retrospective of the work of the incredibly enchanting local artist, FSU Art Alum and adjunct faculty member Linda Hall. On Exhibit at 621 Gallery: Mar 6th – April 25th. Linda Hall will talk about her work, and Patrick McKinney will play music. Free refreshments will be available. There will also be a Maskmaking Workship at the 621 Annex on March 12th & 14th. Art Happy Hour reception Thur, Mar 26, 5-7:30pm.